When I was researching travel options and came across the city of Quetzaltenango, I chuckled an audible chuckle. In junior high school, my best friend, Nancy, and I had a crush on a boy named "Quetzal." He was a year older than us. He played the trombone in the school band. He had milk chocolate complexion, a stylish wave in his thick black hair, and profoundly mesmerizing eyes. In a nutshell, he was dreamy. Beyond dreamy. Nobody could pronounce Quetzal's name, and so we called him "Q," for short. Little did I know that a quetzal was the national bird of Guatemala...and the name of the Guatemalan currency...and the root of the name of the city I would be living in more than twenty five years later. The reason for my visit to Guatemala is to improve my Spanish. My goal is to obtain a moderate level of fluency by the end of my three-month stay in Xela. Guatemala is a popular place to learn Spanish. The language spoken here is pure and thus easy to understand. Furthermore, the language schools are plentiful and reasonably priced. With few tourists, a rich culture, and a healthy supply of language schools, Xela, in particular, is a great place to study. From a distance, the language schools in Xela all seem somewhat similar. Sure, they vary a bit by price and by features, but they all seem to be roughly the same. One thing that most schools offer is the opportunity to participate in a homestay. A homestay is where a student lives in a room of a local family's home and shares meals with that family. While a homestay affords a wonderful cultural experience, it's not well suited to my introverted nature. Homestays aside, I wasn't particularly looking forward to wading through the sea of schools. I decided it'd be easiest to first find a place to live. After that, I'd figure out the school. An AirBnB search surfaced a great room I could rent for the entire duration of my visit. The room was spacious and funky and opened up into a beautiful courtyard. There was a kitchen where I could prepare meals, and the room was located close to the central part of the city. Perfect. Reservation made. As it turns out, the owner of the AirBnB also operates a language school called Utatlan. Choice-of-language-school dilemma resolved. Application submitted. While in Xela, I am taking 25 hours of one-on-one Spanish lessons each week at Utatlan. Having studied Spanish for seven years in school, I'm fairly decent at reading and writing. But listening and speaking, in particular, are my definite weak spots. Unlike other language schools, Utatlan teaches both Spanish and English. Utatlan hires native English speakers to teach its English classes. As English is my first language, and as I have a fondness for teaching (as well as a recently obtained TEFL certificate), I am teaching English once a week to a young Guatemalan woman who aspires to be a doctor. Much to the pleasure of my physical body and my mental well-being, Xela has a yoga studio. After a long day of stretching my brain learning Spanish, I am incredibly grateful to have the opportunity to stretch my body and soul. The Yoga House, where I take yoga classes. Monday through Friday: On the weekdays, I meet one-on-one with my Spanish tutor from 8am to 1pm. In the afternoons, I study for a bit, perhaps I read for awhile, and then I spend some time on the interwebs maintaining contact with my life and responsibilities back home. In the evenings, I attend a yoga class. Saturday: On Saturdays, I teach English for three hours in the morning. After lunch, I tutor online for a Floridian student in business writing. I end the day with a yoga class. Sunday: Sundays are my day of rest -- no studying, no teaching. I make a trip to the market to buy vegetables for the week. I catch up on laundry. Perhaps I read a book. 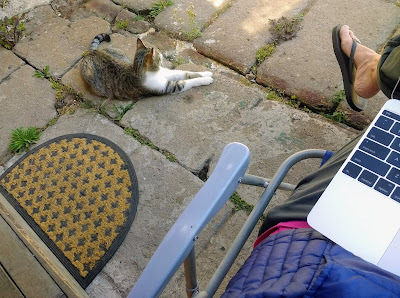 Perhaps I write a blog post...in the sun...with the house kitty at my side. I definitely go for a walk. In recognition that Sunday is my me-day, I do my own yoga practice in my room. Writing a blog post, with the house kitty at my side. My room, where I practice yoga on Sundays. I am grateful to be able to experience so many different grooves in my life. Just a few weeks ago, I was in the housesitting groove, doting on various furry friends in Seattle. Now I'm grooving in Guatemala, learning Spanish, teaching English, and maintaining a daily yoga practice. After my time in Central America, I'll be diggin' the bike bum groove. La vida sure is buena.